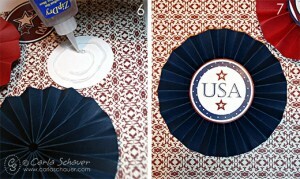 Still looking for July 4th decorating ideas? 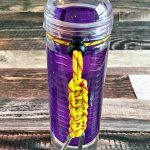 No worries, there is still plenty of time to whip up some patriotic crafty projects before the 4th arrives. 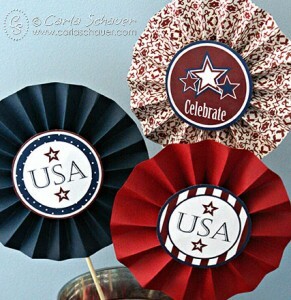 These patriotic paper medallions are quick and easy, and I’m providing a tutorial AND the printables! 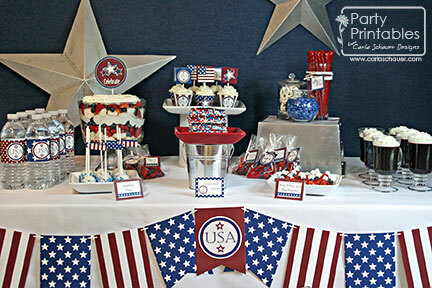 This project coordinates with my Stars & Stripes Printable Party Kit. 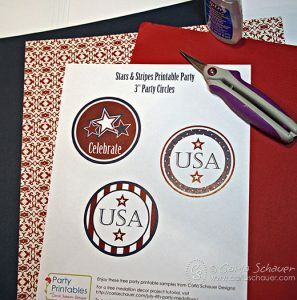 First, Download free Stars & Stripes printable circles. Print the 3″ circles onto heavy white cardstock. 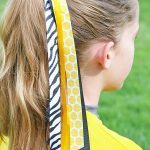 Cut out using a circle cutter, 3″ punch, or plain old scissors. Set them aside for later. 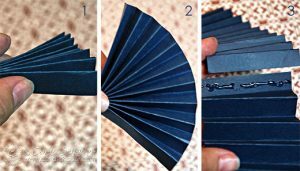 Cut 2 strips of cardstock to 3×12″ each. 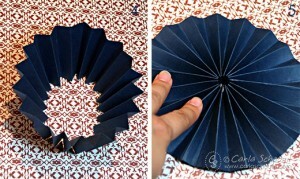 Fold paper accordion‐style into 1⁄2″ pleats (just like paper fans from elementary school!). Each strip will become 1⁄2 of the medallion. Overlap folds and glue together using Zip Dry to form one long strip. Then overlap and glue the open ends together to form a circle. Don’t worry if you end up with a circle that pops up like figure 4. We’ll fix that. Add a drop of Zip Dry in between folds on reverse side of medallion, and gently push the center down to form the folded circle shape. I also like to glue a circle of extra cardstock to the back of the medallion to help secure the circle in place (or a circle cut from a second Stars & Stripes printed circle if I’m hanging the finished medallions). 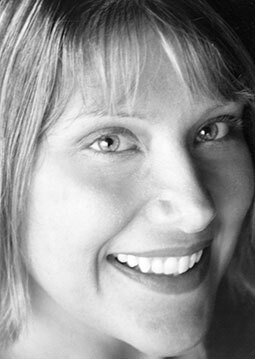 When the medallion is dry, glue the Stars & Stripes 3″ Circle to the center of the front. Don’t be skimpy with the glue here, the extra will sink down into the folds and help adhere the circle more securely. Your medallion is finished! Glue a bamboo skewer to the back of one of the folds, or punch a hole in the top to hang. Repeat with the other freebie circles and remaining cardstock or patterned paper. I chose to add the skewers to my party medallions, trim them to 3 sizes, and pop them in a metal bucket. 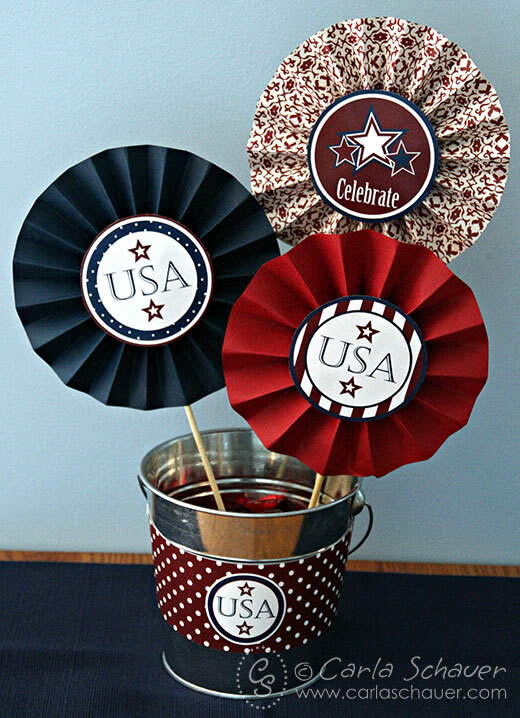 I also added a bottle wrap from the complete Stars & Stripes Printable Party Kit to accent the bucket. Thanks for stopping by! 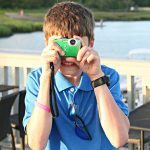 I’d love to see what you make with the Stars & Stripes circles! 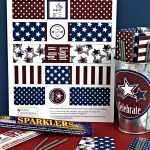 Get the coordinating sparkler holders! 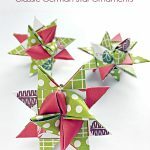 View the July 4th Sparkler Holder project post to download the FREE Stars & Stripes Printable. 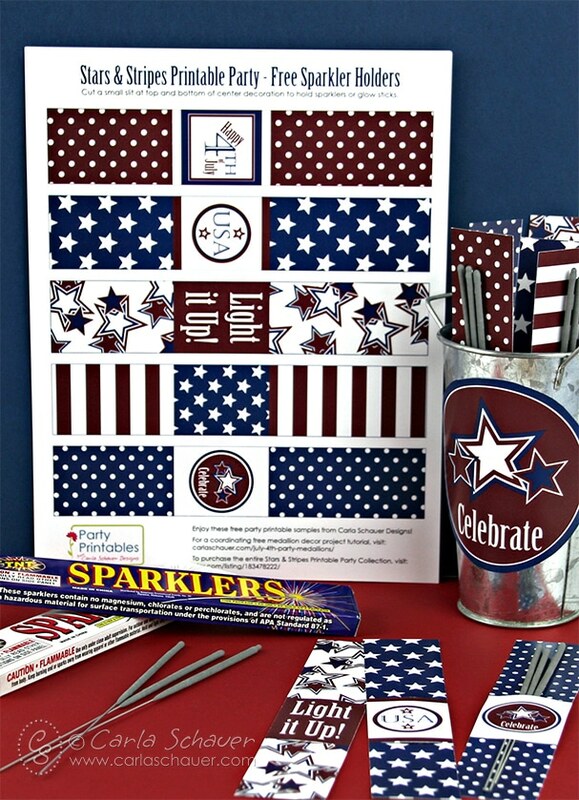 « Stars & Stripes–New Party Printables! You gave great instructions for the medallions. I will be attempting them for the Fourth of July. Thanks for the printable circle.